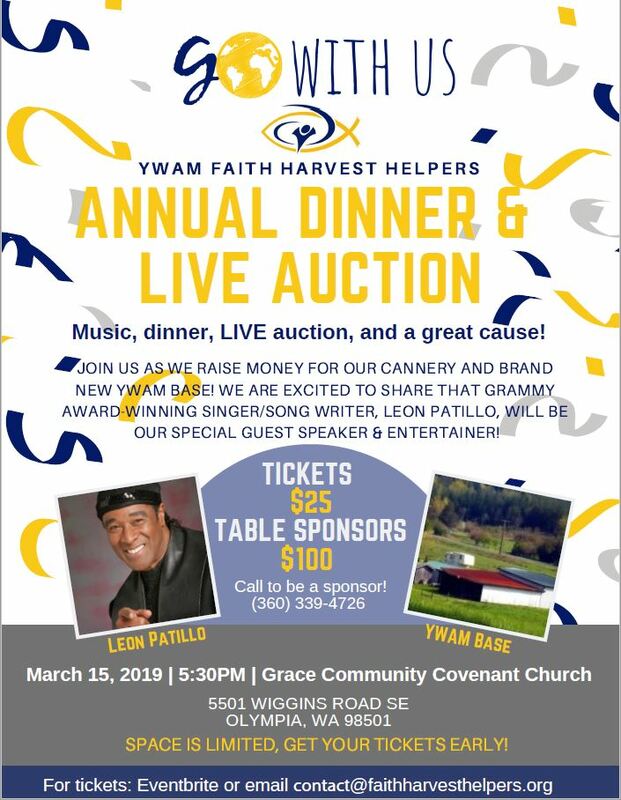 2019 FHH Dinner/Auction (March 15, 2019) Special guest speaker and entertainer for the 2019 Auction is Grammy award winning singer/songwriter Leon Patillo, former member of the band “Santana”. When Leon was singing with the Latin rock and roll group Santana, he would look out into the vast crowds of nameless, faceless people filling the auditorium — some coming just to party, some to be entertained, and some because it was the concert to attend. But some, Leon felt, were coming with heavy hearts, questioning their lives and searching for answers. At the height of his pop career with Santana, Leon left the group with a burning desire to satisfy those hungering hearts with music that would make a difference in their lives. Table Sponsor and Hosts: Share your love for YWAMFHH and help our guests learn more about the future of this ministry. Tables accommodate 8 total place settings. For an additional $100 sponsorship, hosts will receive the beautiful floral centerpieces at the end of the evening and their name or business name will be posted on the table sign. Table Sponsor/Hosts signup is available online on the “donate” page and you can purchase your dinner tickets at the same time. Backstage Pass for Leon Patillo private event. Available only for the first 20 guests, get a backstage pass for a meet and greet session with Leon and his wife Renee one hour before the dinner/concert event. Passes are an additional $75 and include appetizers, photo op and be the first to hear Leon’s new song “We Will Rise” that will be announced that very evening for all over the country. Backstage is 5:00-6:00 pm on March 15. Backstage Passes are available online on our “donate” page. Dinner tickets are still required for general admission and can be purchased together on this link. CAMPUS UPDATE: Pole Barns — Building Permits are in hand! After over 20 months of waiting on the application process to be approved with the county, we began construction on two 36×60 pole barns. One building will house the food processing (clean room) facility and canning operation, and the other is for warehouse / storage needs. We have a large amount of the needed building supplies onsite, but lack metal roofing material. Director Paul Shorb estimates the cost to be around $15,000. If you would like to help raise these barns or make a donation, contact us. Work parties are daily. Needed: Auto Mechanic and construction help. Please continue to pray for favor with the County for the other building permits to proceed. Code Blue Hazardous Weather Alert We are collecting warm winter coats, hats, scarves, gloves, hand warmers and socks in response to the hazardous weather conditions. Please bring the warm items to the office or food bank during operating hours. 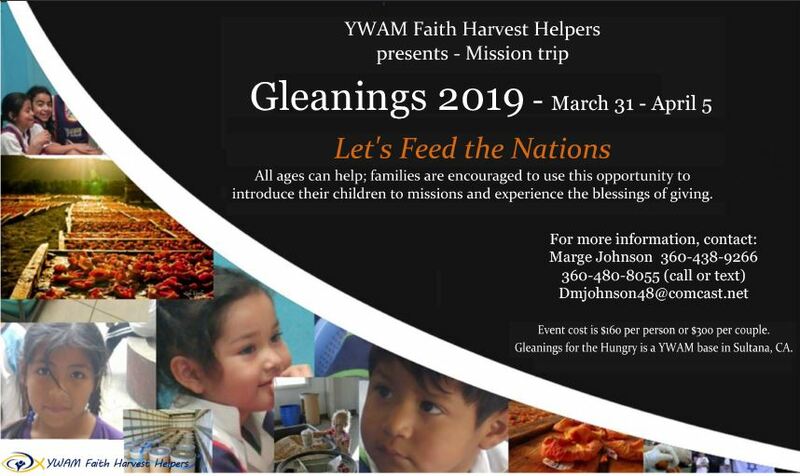 Gleanings Outreach 2019 – March 31-April 5. This missions trip is for all ages, serving Gleanings for the Hungry in Sultana CA. Cost is $165 per person (or $300 per couple) Contact Marge Johnson for details: 360-438-9266 or email dmjohnson48@comcast.net. Annual YWAM FHH Golf Tournament – Thanks to all our sponsors for a fun and successful event. Put next year’s “Feed the Hungry” golf tournament on your calendar so you can join the fun: Saturday, August 24, 2019 at Riverside Golf Club in Chehalis. More about YWAMFHH – Learn more about current events and ministry opportunities by clicking these links: read YWAMFHH newsletters and watch YWAMFHH Youtube channel videos. Food Bank Drivers for pickup. If you could help us with any of these needs please contact OfficeManager@faithharvesthelpers.org or call 360-339-4726 for details. Please fill out the Volunteer Opportunities form. Annual Reports: The YWAM Faith Harvest Helpers annual reports are downloadable for review.